Spray a 9×13-inch (23×33 cm) baking dish with cooking spray. In the baking dish, whisk the eggs, milk, salt, pepper, and garlic powder. Mix in broccoli, red onion, and bell pepper. Bake until the top starts to get golden brown, about 25 minutes. Place the deli meat and bacon on a 9×13-inch (23×33 cm) nonstick sheet pan. Bake 5-10 minutes, or until they reach desired doneness. Arrange the sliced English muffins on another sheet pan. Broil for 5-10 minutes, or until they reach desired doneness. Once your eggs cool, slice into 6 squares. Cut your parchment paper into 8×8-inch (20×20 cm) squares for each breakfast sandwich. 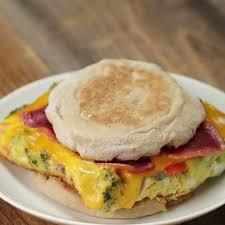 Lay a moistened paper towel across the parchment and assemble your breakfast sandwiches. Wrap the assembled sandwich in the moist paper towel first, to ensure freezer freshness and even cooking when microwaved. Wrap in parchment and label. Store in an airtight plastic bag or container up to one month in the freezer. When ready to eat, remove the parchment paper and microwave on high for 2-3 minutes. Allow to cool.